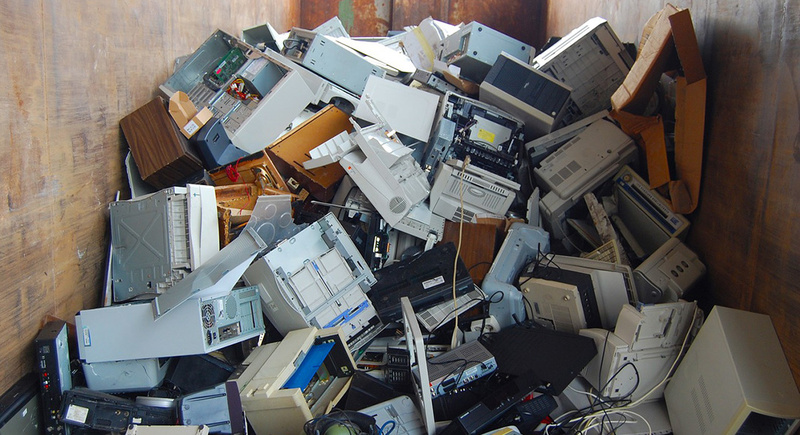 Most people think of e-waste as old electronic goods that get stored in drawers and cupboards. Cell phones, laptops, radios and chargers – all the old devices that you’re just not sure how to dispose of. However, e-waste is more than that. Mining, manufacturing and a range of other industries produce vast amounts of e-waste every year, and some of the discarded items are worth millions. No matter how much recycling recovers some of these valuable materials, we still discard more than we can process. Data from waste reports often separates producer waste from consumer waste, but is the electronic waste from industry any different to household gadgets and goods? These two categories are actually two sides of the same coin. Most electronic components and devices contain copper – in fact, the electronics industry is the second largest consumer of copper after the construction sector. Copper is a valuable and recyclable material. Around one-third of copper is actually salvaged from scrap materials, while the rest is mined. However, for every kilogram of copper that is mined, about 210 kilograms of mine waste is created. The Chuquicamata copper mine in Chile is one of the largest in the world and generates over 298 000 tonnes of mine waste every day. This mine produces as much waste (by weight) in a single day as Chile produces e-waste in two years. Most of this waste is earth, rubble and side products of the smelting and processing of copper ore. However, machine components, mining equipment and other electronic devices do account for some of the waste. Similarly, the manufacturing industry (especially for digital devices) produces large volumes of discarded e-waste – more than the consumers produce when they are done with the gadgets. Electronics manufacturing creates almost five times as much waste as households discarding old appliances. Data from electronics manufacturers indicates that the majority of carbon emissions over a device’s lifetime actually stem from the manufacturing process itself. The production of televisions and computer screens releases fluorinated greenhouse gases into the atmosphere, which are some of the most persistent emissions contributing to global warming. Once the devices have been purchased, the environmental impacts of their use can be harder to track. These devices require electricity to run, which comes from hydropower or burning coal in South Africa. The waste extends beyond the product and into the means required for these electronics to work. This electricity for digital devices accounts for two percent of the total global greenhouse gas emissions and rising. Although recycling is a great step towards cutting down e-waste and the waste created by mining and manufacturing, we still need to do more. One solution is to repair and upgrade the devices we already own. Manufacturers of cell phones are known to make their products slow down after a few years to force consumers into buying the latest models. However, a more environmentally-friendly alternative would be to offer repair and update services that allow consumers to benefit from the latest tech and software of their older devices. Some nations have already created legislation around the repairability of cell phones and other gadgets. Making electronic goods more durable and easy to repair will help reduce the e-waste from discarded devices and the manufacturing process. Electronic goods not only produces e-waste, but the creation process has massive environmental impacts. From mining to manufacturing, the waste created by the digital industry extends far beyond household e-waste.